A monument commemorates John Oxley who camped in the area during his exploration of the district in 1818. John Oxley was Surveyor General of Lands of New South Wales and the First European to explore this district, the home of the Kamilaroi tribe. Having departed from Bathurst on 28th May, 1818 to trace the course of the Lachlan River, he passed this way on 26th August ,1818 . 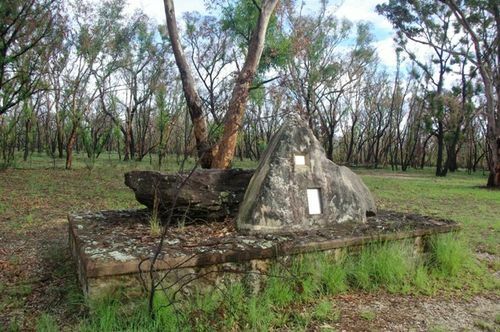 On the way he climbed a small hill four kilometres west of this site, where he obtained his first glimpse of the Liverpool Plains which he named after the British Prime Minister. He recorded in his diary, " A smart frost during the night ; the morning fine and clear. At eight o'clock we proceeded on our route, taking a more easterly direction according to circumstances. Between three and four miles from our camp we had an extensive view to the east and south-east, and saw with extreme satisfaction a lofty chain of fine forest hills thinly timbered, bearing east south-east of us, a distance of fourteen or fifteen miles. To the east were extensive flats, bare of timber, and apparently either composed of white sand, or covered with dead grass. " After Crossing the Great Divide and discovering the Hastings River and Port Macquarie, his party arrived at Port Stephens on 1st November, 1818. Oxley's exploration led to the discovery of the Castlereagh River and the Warrumbungle Mountains and the opening up and settlement of this district. When at Black Mountain, called Lodestone Hill by Oxley, variations in his compass readings were caused by the rocks, some of which have been used to complete the top of this cairn. Erected by the Coonabarabran Historical Society together with the Coonabarabran Shire Council.